One of the most challenging aspects of rhinoplasty is the tip modification. This is partly due to the unique tripod nature of the nasal tip cartilage. Alar rims are one of the most important components of this structure. 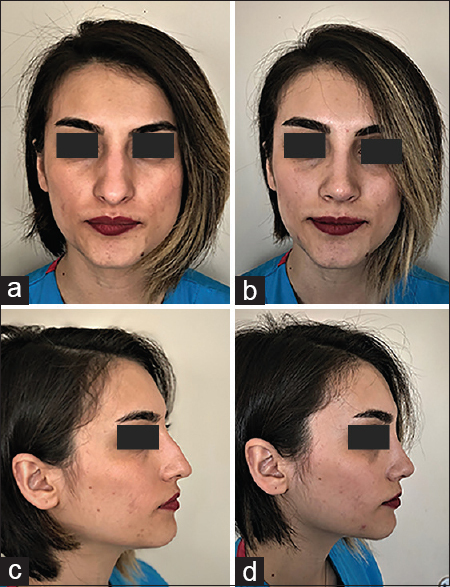 Alar rim deformities could be congenital or due to a complication of a previous rhinoplasty in which excessive resection of cephalic part of the lower lateral cartilage was performed. Alar retraction and alar notching could be seen in these patients. Alar columellar relation has been defined in previous studies.,, Ideal alar rim position should be at most 2 mm cephalic to the line drawn from the most posterior to the most anterior portion of the nostril. Alar rim grafts or alar contour rim graft defined by Rohrich et al. are frequently used to correct alar rim defects.,, These grafts can cause visibility issues since these are nonanatomical by nature. In addition, in open rhinoplasty, these grafts can potentially twist and cannot be larger than the prepared subcutaneous tunnel to place the graft. Otherwise, larger grafts could cause undesired bulking. In some patients, despite the correction of the retraction deformity, irregularities, and hollowness can persist in the soft triangle. In this paper, we present the results of an anatomical graft used to correct alar notching and the deformity in the soft triangle region. Twenty-four patients were included in the study (10: Female, 14: Male). The average patient age was 28 (range: 20–41). In 16 patients primary rhinoplasty, in 6 patients secondary rhinoplasty and in the remaining 2 patients tertiary rhinoplasty was performed. The indications to use the graft were to treat or prevent alar notching, alar retraction, soft triangle deficiency, and irregularity. Open rhinoplasty with transcolumellar inverted-V incision and bilateral marginal rim incision was performed. Marginal rim incision followed the anterior border of lower lateral cartilage and distal to its border. Mucosal tissue was kept intact. Lateral crus were dissected from the underlying mucosal tissue. Most of these patients had deformities caudal region of intermediate crus which corresponds to the domal area. Dissection was carried on to the posteriorly. All nasal components (deformed septum, upper lateral cartilages, and lower lateral cartilages) were exposed and examined intraoperatively. If present, the septal deviation was corrected. Let down osteotomy was performed in patients who required osteotomy. Septal cartilage was used in 18 patients and the remaining 6 patients costal cartilage was used. These six patients were secondary and tertiary patients. The harvested cartilage grafts were reshaped in an ellipsoid fashion with a width of 0.5–1 mm, a height of 4–6 mm and a length of 1.5–2 cm [Video 1]. These prepared grafts were placed under the intermedial crus and caudal part of the lateral crus [Video 1]. The grafts were sutured with 6/0 polydioxanone Suture to the lateral crus [Figure 1] and [Figure 2]. Domal sutures were used to modify the tip. Primary closure of the mucosa and skin was performed. Silicone internal splint and thermoplastic external splint was placed. Following the first postoperative day, patients were examined for checkup and donor site control. Internal/external nasal splints and sutures were removed at the end of the first postoperative week. Following the removal of all sutures and splints, patients were followed up at 2 weeks, 1 and 3 months postoperatively, and thereafter at 3-month intervals for 1 year. After 1 year, patients were followed up annually. The average follow-up time following the surgery was 15 months (range: 6–24 months.) In all patients except one alar notching and soft triangle deficiency was successfully treated [Figure 3] and [Figure 4]. In one patient, minimal notching persisted following the surgery and the patient did not want any revision surgery. We did not encounter gross absorption, graft exposure, graft visibility, or recurrence of deformities in any patient. The correction of alar deformities is very crucial in obtaining nasal harmony both aesthetically and functionally. Ideal alar rim anatomy should resemble an equilateral triangle from the basal view. Deficiency and the deformity of the cartilage in the alar region can result in alar retraction, alar notching, and increased columellar show. Various nonanatomical and anatomical grafts have been defined for the correction of this deformity. Rohrich et al. have defined alar contour graft for implementation in mild to moderate level of alar retraction which has gained popularity among surgeons. Alar rim grafts are frequently used by surgeons to prevent or treat alar rim deformities. However, these grafts despite their usefulness and functionality are placed in nonanatomical fashion and can become visible under the skin. In the technique defined in this paper, the graft is placed under the intermedial crus and lateral crus in an anatomical fashion thus the risk of visibility is minimized. Gruber et al. have reported in a previous study that alar rim grafts can twist inside the tunnel they are placed in. In this technique, the graft is sutured to lateral and intermedial crura, and the risk of twisting is minimized. Foda has previously defined soft triangle and extended soft triangle graft for the treatment of soft triangle deficiency. In this study, the cartilage graft was most frequently harvested from cephalic portion of the lower lateral cartilage, and the graft was in a triangular shape. In our modification, the graft was harvested from septal or costal cartilages to increase the strength of the cartilage, and the graft was prepared in an ellipsoid shape. We think that this shape is better suited for the prevention or treatment of alar retraction which usually occurs at the lateral of the nostril. Bulbous tip is frequently addressed with cephalic resection. However, this approach can cause dead space, and lateral crus can migrate cephalically.,, This can cause alar rim contraction which can be corrected by the placement of cartilage grafts. General wound healing principles apply to rhinoplasty as well which means scarring and contraction can follow excision. In this technique, cartilage graft is placed under the intermedial and lateral crura in caudal direction and can correct any soft tissue contractures in this area by pushing the tissue in a caudal fashion. This approach also pushes the alar rims caudally to correct alar retraction. As oppose to alar rim grafts, two independent cartilages are not present with this technique which result in a more natural repair. Since the graft is sutured to the lower lateral cartilage, this technique also increases the stability of the lower portion of the lateral crus. At the same time, the intermedial crura structure is strength is increased, and the soft triangle deformities can be fixed. Gruber et al. have previously reported that in cases where there is a normal alar and columellar relation cephalic resection can be tolerated. However, in cases where there is a borderline relation between ala and columellar, cephalic resection can lead to alar retraction. If the surgeon prefers to the cephalic resection in these borderline cases, this technique can be used to replace the alar rim grafts to prevent alar retraction. We think that this technique can be used in alar notching and soft triangle deformities whether for prophylactic or therapeutic purposes. Gruber RP, Zhang AY, Mohebali K. Preventing alar retraction by preservation of the lateral crus. Plast Reconstr Surg 2010;126:581-8. Daniel RK. The nasal tip: Anatomy and aesthetics. Plast Reconstr Surg 1992;89:216-24. Gunter JP, Rohrich RJ, Friedman RM. Classification and correction of alar-columellar discrepancies in rhinoplasty. Plast Reconstr Surg 1996;97:643-8. Guyuron B, Behmand RA. Alar base abnormalities. Classification and correction. Clin Plast Surg 1996;23:263-70. Guyuron B. Alar rim deformities. Plast Reconstr Surg 2001;107:856-63. Toriumi DM, Checcone MA. New concepts in nasal tip contouring. Facial Plast Surg Clin North Am 2009;17:55-90, vi. Rohrich RJ, Raniere J Jr., Ha RY. 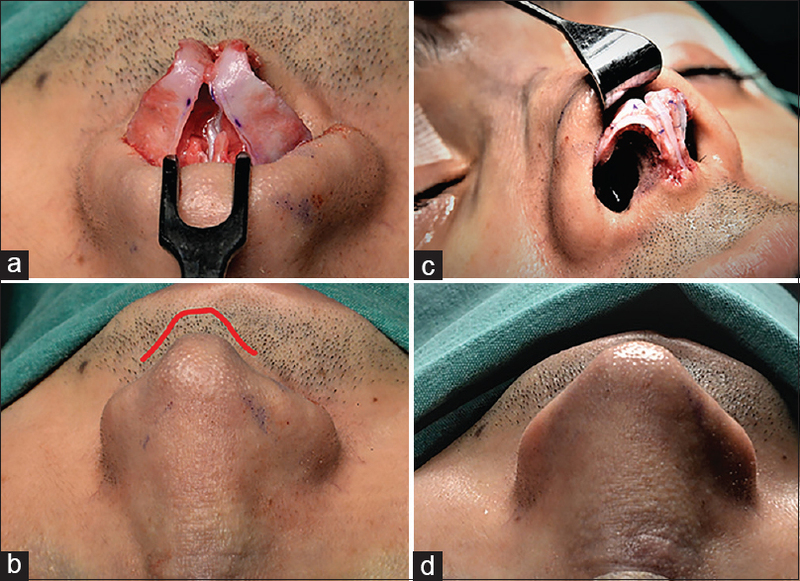 The alar contour graft: Correction and prevention of alar rim deformities in rhinoplasty. Plast Reconstr Surg 2002;109:2495-505. Gruber RP, Fox P, Peled A, Belek KA. Grafting the alar rim: Application as anatomical graft. Plast Reconstr Surg 2014;134:880e-7e. Foda HM. 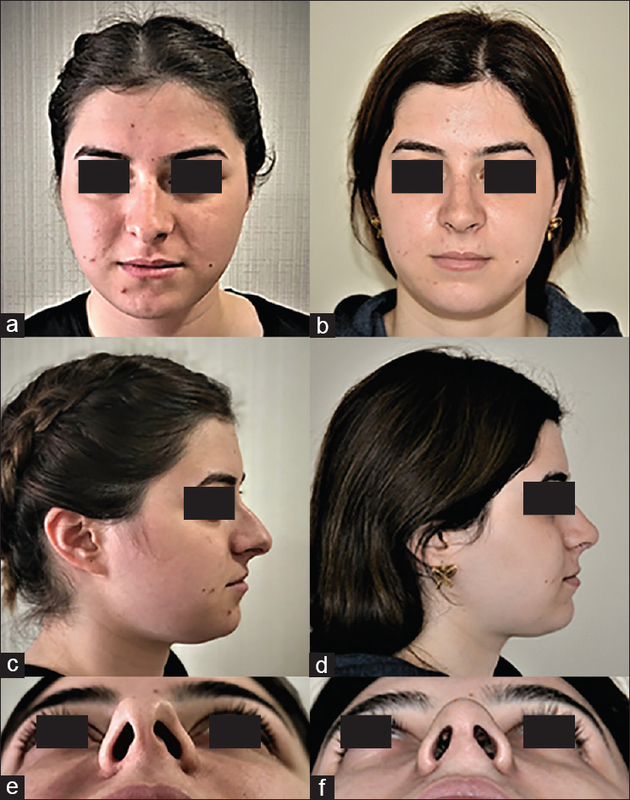 Nasal soft-tissue triangle deformities. Facial Plast Surg 2016;32:339-44. Toriumi DM. Difficult revision case: Foreshortened nose and severe alar retraction, two prior rhinoplasty surgeries. Facial Plast Surg Clin North Am 2006;14:401-6, viii. Menick FJ. 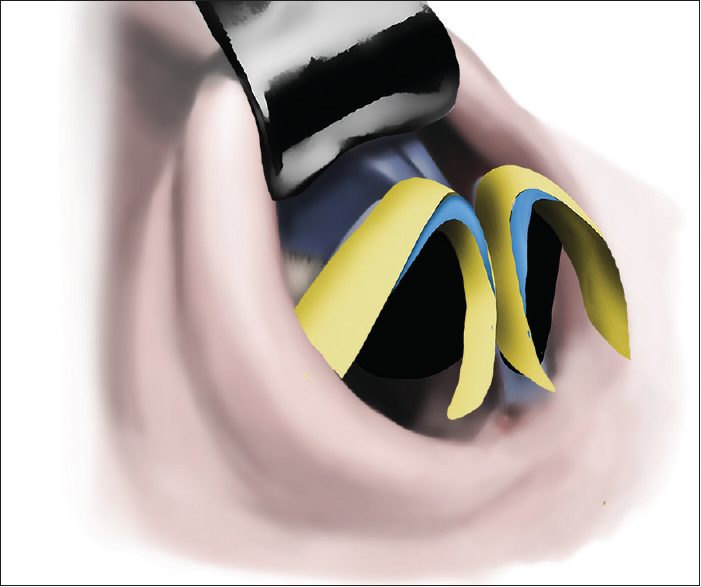 Anatomic reconstruction of the nasal tip cartilages in secondary and reconstructive rhinoplasty. Plast Reconstr Surg 1999;104:2187-98. Gubisch W, Eichhorn-Sens J. Overresection of the lower lateral cartilages: A common conceptual mistake with functional and aesthetic consequences. Aesthetic Plast Surg 2009;33:6-13.